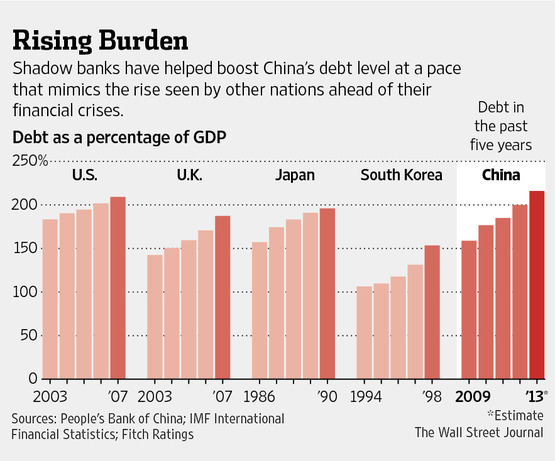 China’s policy makers are facing a real challenge to deal with the fast and furious debt buidup. The comparison below is alarming. 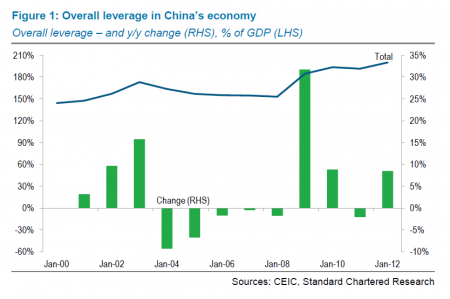 Now, it looks as if China’s stimulus plan enacted during 2008-09 period may have just postponed the crisis, not killed it. As we say, there is no free lunch. 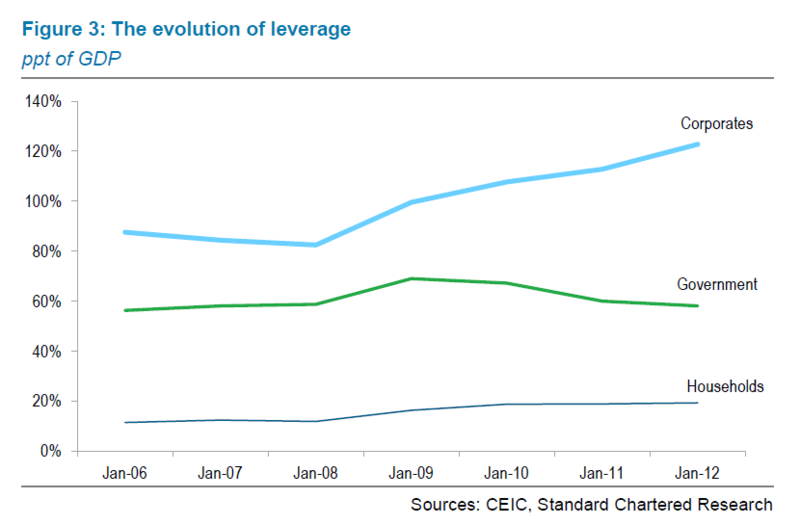 A recent report from Goldman Sachs shows that most debt, more than 70%, is concentrated in the corporate sector. 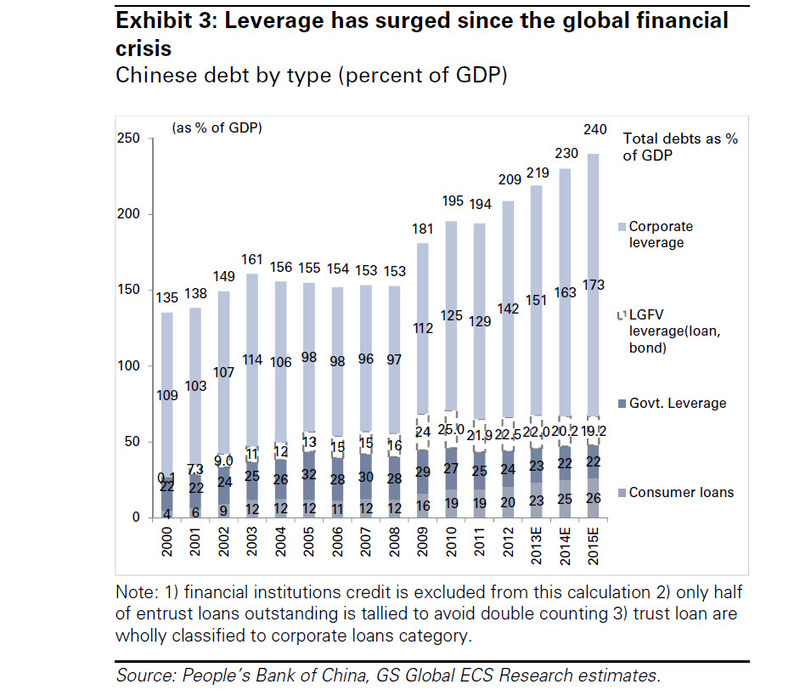 My hunch is that most of the leverage in the corporates came from large state-owned enterprises (SOEs), or investment vehicles created by local governments, the so-called LGFVs. See the chart below (courteys of GS). Ordos, the little known prairie city in China’s inner-Mongolia autonomous region, now has become the extreme example of China’s housing bubble. 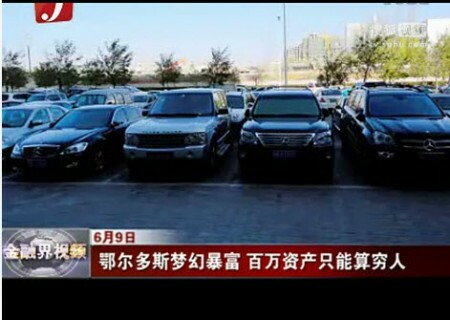 Due to extreme housing speculations and land sale (mostly grassland), loads of local farmers became instant millionaires: its GDP per capita recently surpassed Hong Kong; people with assets of 1 million Yuan (or $150,000) are actually considered “poor”; in 2010, 90% sale of Land Rovers (the symbol for power and masculinity in Chinese taste) in mainland China found its buyers in Ordos…and imagine a cleaning lady driving a Toyota Land Cruiser to work? All this can’t be due to China’s fast economic growth. This is simply not sustainable. 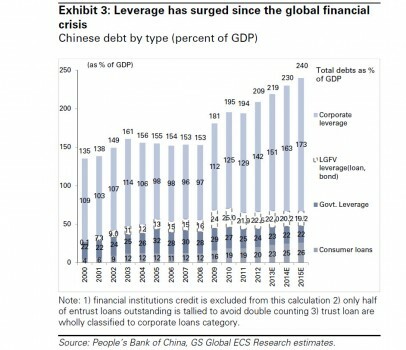 I see a classic asset bubble forming, reminiscent of many bubbles in history. It will burst eventually no matter what. 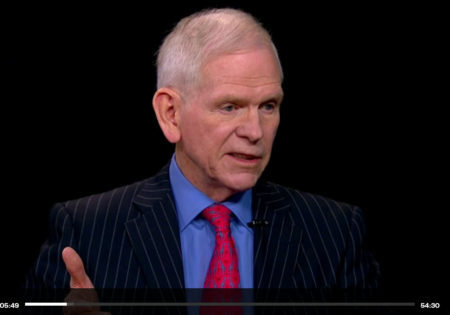 When you see the gold promotion video come out that is geared toward the mass audience, such as the one below, you know gold bubble has entered another stage. Until the Fed dramatically reverses its easy monetary policy (i.e., when the real interest rate turns positive and rising), gold price still has several legs to go. 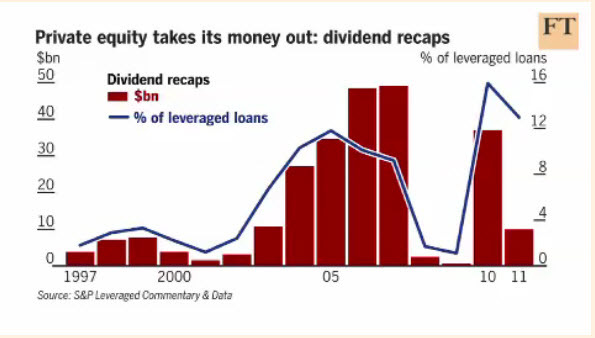 But be head clear that the gold bubble will eventually crash, just like every asset bubble. Timing in investment is utterly important. Housing market tends to be local. It’s rare to see a nationwide price decline. 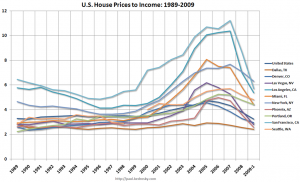 The recent US housing bubble is an exception and often considered a black swan. 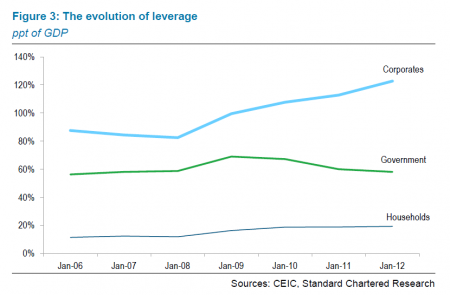 People have been talking about China’s housing bubble for a few years now (see my previous post on China’s housing bubble debate), but where exactly is the bubble located? 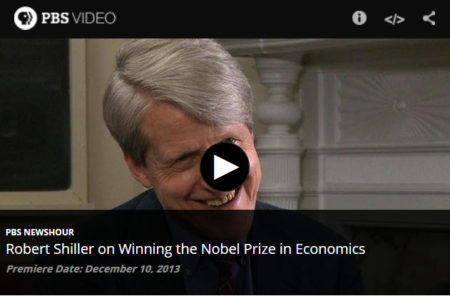 The recent NBER research sheds some light on the issue. 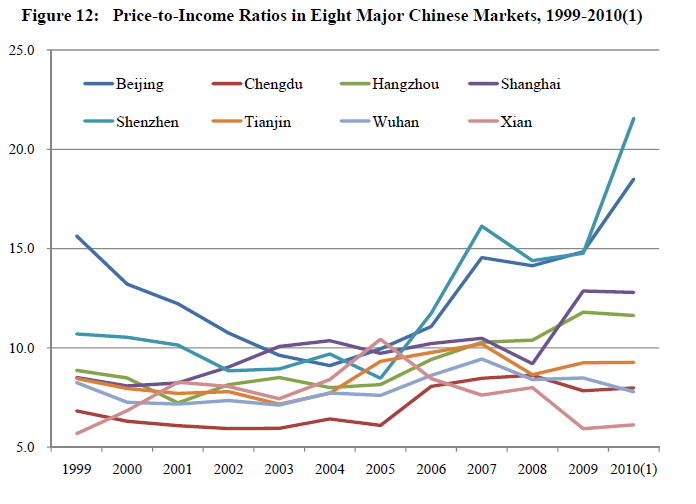 The graph below shows the price-to-income ratio of China’s eight major cities, from 1999 to Q1 of 2010. 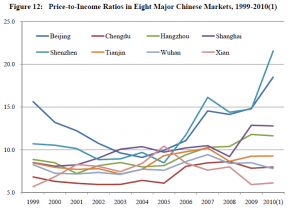 Beijing and Shenzhen are clearly in bubble-shape — the typical and familiar parabolic surge in price, and they are followed by Shanghai and Hangzhou. Now, let’s have some comparative perspective. How the same ratio compares to the major cities in the United States. 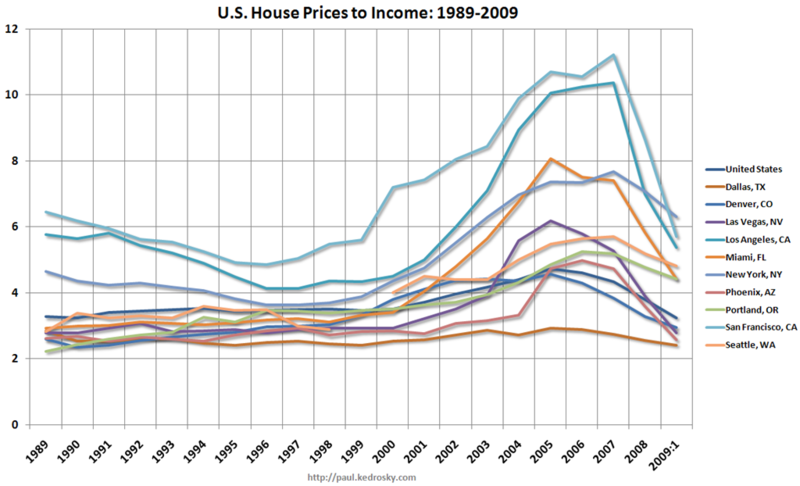 The graph below (courtesy of Infectious Greed) shows the price-to-income ratio of US cities. San Francisco, Los Angeles, Seattle were among the highest. At the peak of the housing bubble between 2006-07, the same ratio for San Francisco, the highest among all US cities, was around 11. 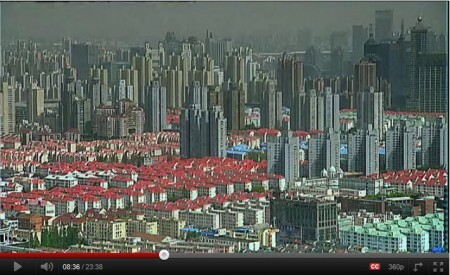 In contrast, Beijing has a ratio of 18, and Shenzhen at astonishing 22.